Koh Samui is one of the most popular destinations when it comes to holidays in Thailand. Situated in the Gulf of Thailand, the island offers many sights and activities for visitors. Many of the tourists come because of the beautiful beaches of Koh Samui, but the sights don’t come off badly, too. Some of the attractions of Koh Samui have an entrance fee. What many visitors don’t know, there are a lot of sights, which are worth a visit and free of charge. In this list you will find out which of the sights of Koh Samui are free to visit and definitely not to miss. The easiest and fastest way to Koh Samui is with a direct flight from Bangkok, Kuala Lumpur or Singapore. The international airport of Koh Samui was built by Bangkok Airways and therefore the price for a flight ticket is kind of more expensive, because they preserve a monopoly – with a few exceptions. It’s cheaper when you go to Surat Thani or Nakhon Si Thammarat on the mainland of Thailand. Airlines like AirAsia, Thai Lion Air and Nok Air fly to those cities from the Don Mueang airport in Bangkok. At the destination airport you can take a bus to the Donsak Pier or Tapee Pier and from there a ferry to Koh Samui. You can find the cheapest flights to Koh Samui on Skyscanner. I absolutely can recommend Thai Lion Air by the way. Note: Bus and train connections are also available if you want to arrive even cheaper. However, the travel time increases a lot. Tickets and information on times can be found at our partner 12go.asia. 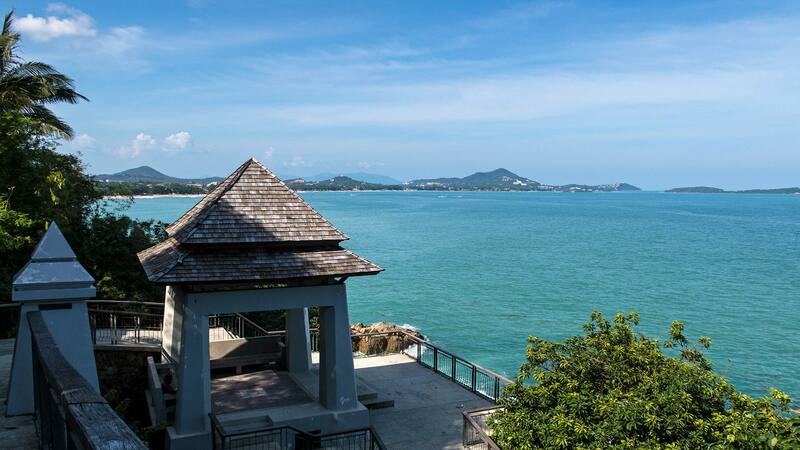 One hotel where we felt comfortable from the very beginning was the Amari Koh Samui. If you want to stay at the beautiful Chaweng Beach, but not directly in the relatively busy center, the Amari is just right. Despite the central location you will have your peace – we liked it very much! The hotel offers 2 swimming pools and beautiful, modern furnished rooms of different categories – depending on your budget. We definitely recommend this hotel and would stay there again anytime. 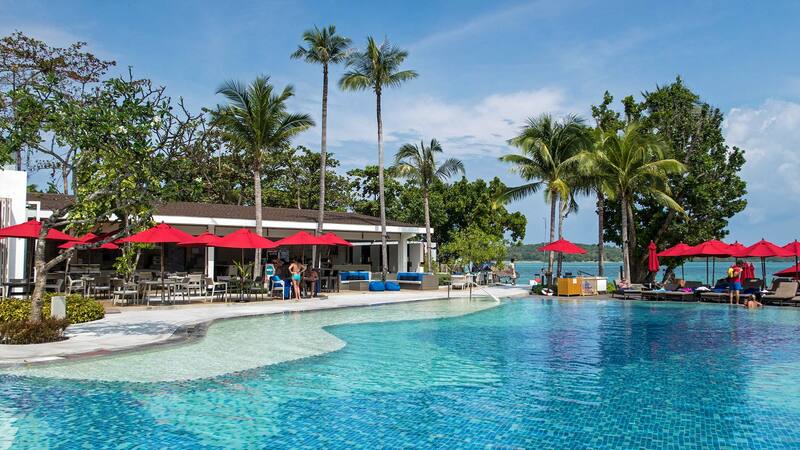 Find more hotels on Koh Samui here. 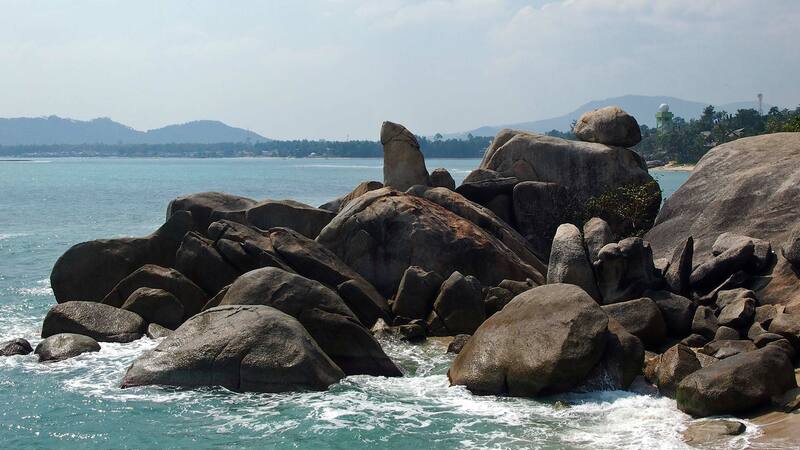 The rocks Hin Ta and Hin Yai, as this attraction is called in Thai, are located at the southern end of Lamai Beach. They are also signposted under this very name on the large ring road of Koh Samui. The two rocks are one of the most photographed sights on Koh Samui and also free of charge. Even many locals come to this place because a legend says that ages ago a married couple shipwrecked here and now the locals believe that the visit increases the fertility. However, the parking of a scooter or car isn’t free. The price for that is 10 and 40 baht (€ 0,25/€1,00), which is alright in my opinion. Between Chaweng and Lamai, also on the big ring road, there is the Lat Ko Viewpoint located on a hill. From here you have a wonderful panoramic view over the Chaweng Beach and surrounding areas. From the beautifully designed viewpoint a path leads down to the rocks by the sea. This is also a popular viewpoint to see the sunrise. Of course, everything is free of charge. Tip: At the parking lot of the Lat Ko Viewpoint you can find an ice cream truck on a daily basis, which offers delicious coconut ice cream. Absolutely recommendable. 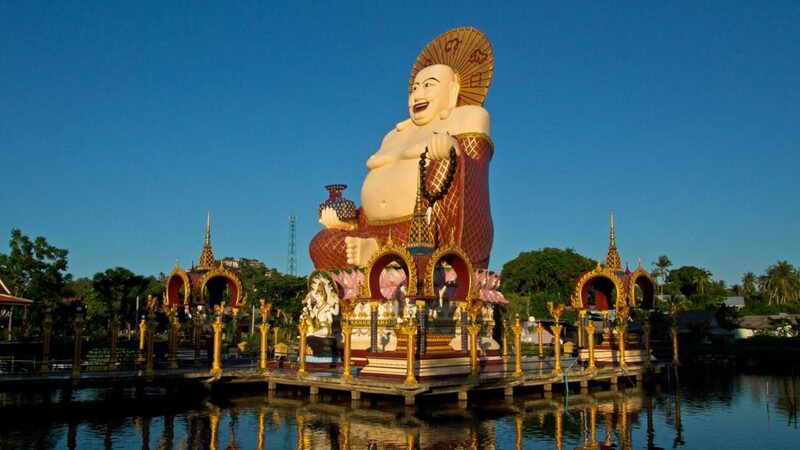 The 12 meter high Buddha statue is one of the landmarks of Koh Samui. It is located in the Wat Phra Yai temple and was built in 1972 on the small island Koh Fan, which can be reached via a causeway from the village of Bangrak. You can visit the temple complex for free, however a donation for the preservation of the temple is always gladly seen. The best times to visit the temple would be the early morning as well as the late afternoon, as the steps to the Big Buddha will be too hot to walk on during noon. As usual in Buddhist temples, you are only allowed to enter the temple without shoes. It is also surrounded by some souvenir shops or vendors that sell drinks and some snacks, if you are looking for that during your visit. 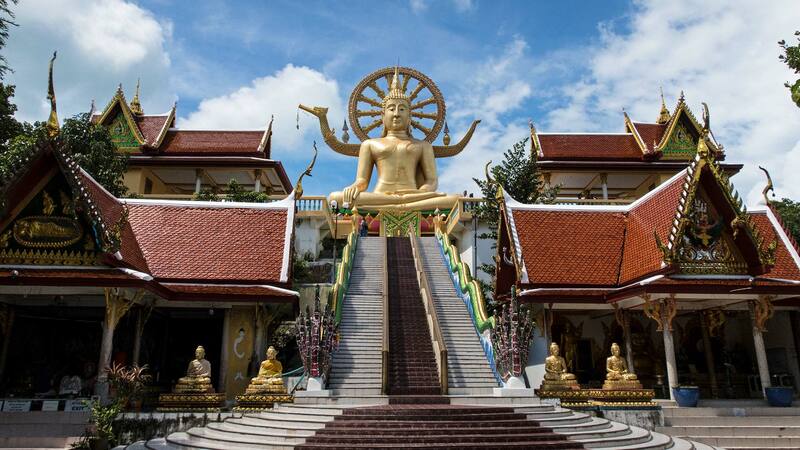 Built in 2004, the Wat Plai Laem is one of the most fascinating temples of Koh Samui. 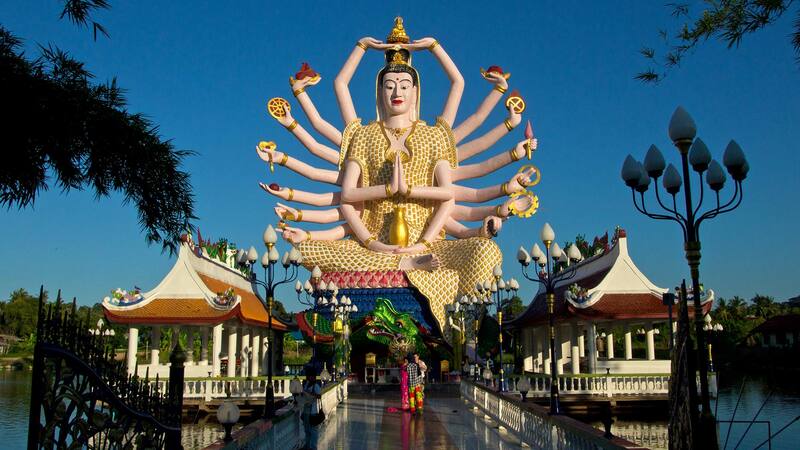 On site you will find a huge “fat” Chinese Buddha as well as a statue of Kuan Yin with 18 arms. 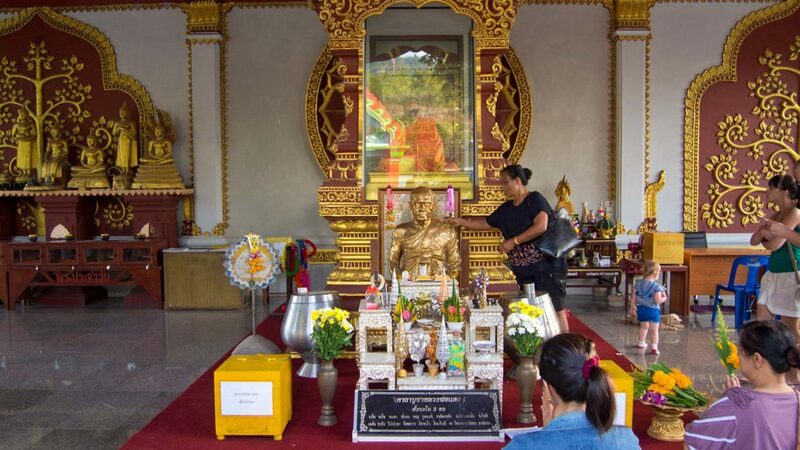 It is the Chinese Buddha of compassion and is especially worshiped by the Thai-Chinese residents. There is also a large lake with turtles and fish, which you can feed for a donation of 10 baht. The temple complex is still being extended so that there will be more statues of Buddha and temple buildings over the years. The entrance is free of charge, but a donation for the preservation and expansion of the temple is very welcome. Most of the visitors only come to the Big Buddha Pier in Bangrak to take the Haad Rin Queen ferry to Koh Phangan or because most of the Ang Thong Marine National Park day trips start over here. Due to the boat traffic by both tour operators and local fishermen and lack of shady spots, the Big Buddha Beach isn’t suitable for a relaxing day at the beach or to go swimming. But if you like to see a beautiful sunset, it’s just the right spot. 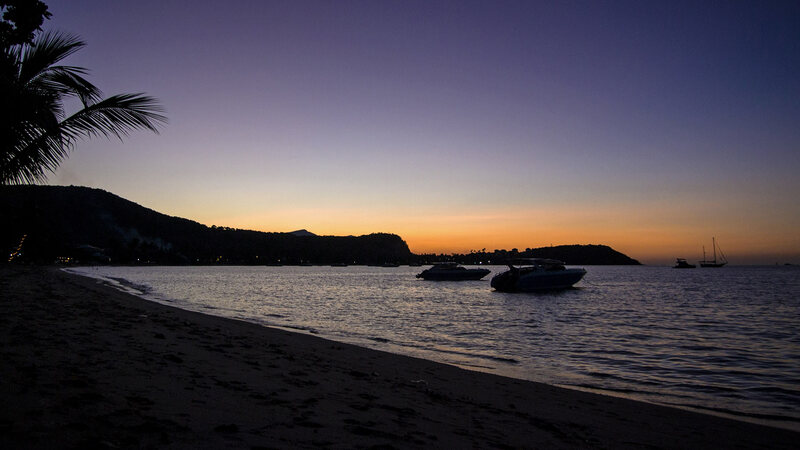 Not many beaches on Koh Samui, apart from those at the west coast, offer a nice sunset view. You can buy a drink in the nearby convenience stores and make your self comfortable at the beach or the pier and watch the sunset behind the hills of Koh Samui. The Waterfall 2 is one of two Namuang waterfalls and in my opinion the more beautiful one. At the end of the waterfall there is a small natural pool where you can have a quite nice but cold swim. It’s also signposted at the big ring road of Koh Samui. Before you get to the waterfall, there is the Namuang Safari Park where most of the people park their motorbikes and go on with an off-road jeep to the waterfall for a fee of 100 baht. You can easily save your money when you turn the next street right after the parking lot and don’t stop over there. If you follow that very street you will find a road fork. The way up leads to a higher entrance of the waterfall, which has a water slide etc. But there you have to pay an admission. If you follow the way down the road, you can visit the waterfall for free. The Wat Khunaram temple is located near the entrance to the Namuang Waterfall 2. Many locals come here to pray and tourists mostly visit to see the mummified monk, whose corpse hasn’t decayed for ages now. According to history, the monk predicted his exact day of death and that his body won’t decay. He died 1973 in this very seated position and his body has always been protected against external influences and exposed in a glass case. It’s really impressive to see him with his orange robe and the sunglasses sitting there peacefully. 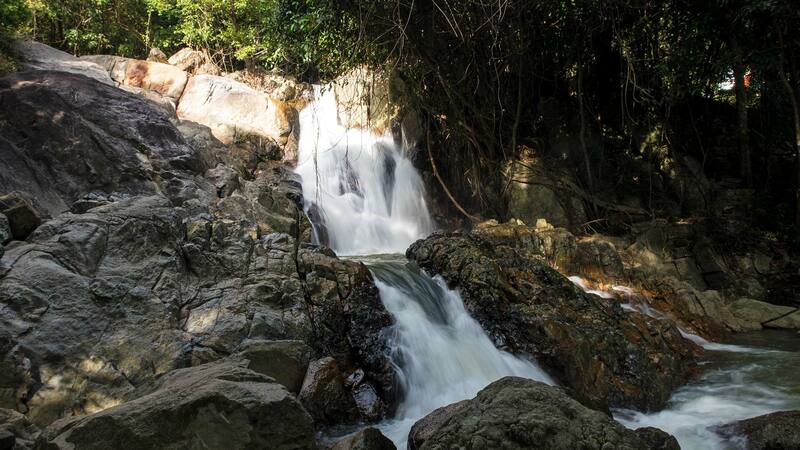 Of course you can explore many more sights on Koh Samui than the 7 we listed above. Read our article about 16 things you can experience on the Koh Samui to find out more. Have you ever been to Koh Samui? Which free sights can you recommend? Leave us a comment below! Wow, the picture of the statues of big Buddha and other four small Buddhas have valued the post. Near the temple of the Big Buddha there is a small cafe for 5 seats overlooking the pier. In the evening when the boats return back, it’s nice to have a cup of coffee looking at the sunset. you definitely got the 7 most popular sight seeing spots at Koh Samui. Just stumbled across this old blog post and just love it. Super photos! I love the second picture..it looks so serene!